Take it slow and don't get frustrated: When organizing a closet, people usually take everything out and then get overwhelmed, leaving the project unfinished. Take it slow and don't work for more than one hour continuously. This way you will see progress as you work and complete parts of a task instead of getting exhausted with one big task. Stay away from distractions: Always have a "goes elsewhere in the house" box next to you so you don't have to leave every time you find a misplaced item that goes in a different room. Once you are done, take the box and distribute the items where they belong. Think like your family: There is no point in working on a system to stay organized if your family won't stick to it. If, for example, they won't hang their coats up on the hooks you have on the wall, placing a bench by the door might be a better idea - they can throw their belongings on the bench instead of spreading them all over the house. Throw it out: It is hard to get rid of items, especially if they have sentimental value. However, you might realize you are surrounding yourself with items that have absolutely no use for you when there are so many people who need them and can't afford them. If you have clothes you haven't worn over the last two years, most likely you will never wear it again. Donation centers such as Goodwill will take most items you are ready to throw away. Use the right tools: Labels, boxes and vacuum bags are great tools to organize your home. Your coats and winter clothes can be sealed in vacuum bags and put away for the summer on the top shelf of your closet. Labeled boxes allow you to gather similar items and finding them in no time when you need them. Don't forget to measure the spaces where you plan on putting the boxes so you can look for the right sizes. 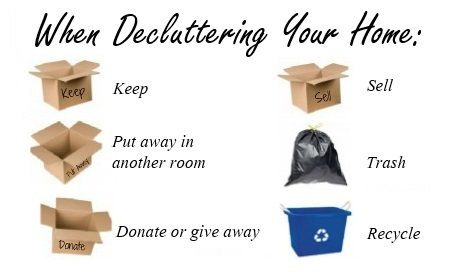 The idea of decluttering your home might seem daunting, but it is possible. Develop a plan for reorganizing and stick to it, don't worry about finishing it fast, worry about making progress instead. Keep in mind that there is a beautiful home behind all that clutter, and the benefits are worth the work.